Now that we’re all eating healthier, many of us are really paying close attention to those food labels. I know I am. Case in point, I was at the grocery store the other day and wanted to pick up a can of Green Enchilada Sauce to make some homemade enchiladas. Wait….what?! Soybean Oil? MSG? In enchilada sauce? And although it was pretty low in calories – half of the calories were from fat! 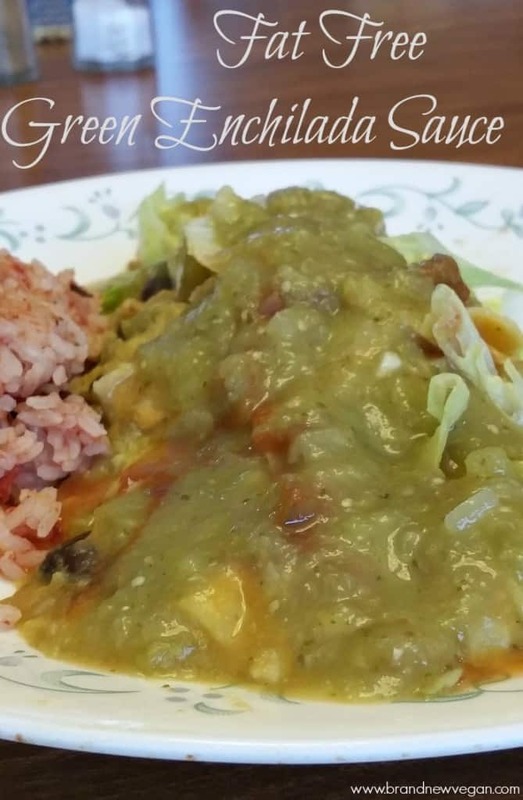 I can make my own fresh, homemade Green Enchilada Sauce without all that extra ‘stuff’ added. I say better, because you can make this simple green enchilada sauce at home, and it’s way better than anything you can find in a store. Why? It’s made from fresh, whole food ingredients. No oil. No MSG. No strange chemicals. I also tried to use regular ingredients you can find anywhere. Although I love my Hatch Green Chiles, I realize not everyone has access to them, so this sauce used those little 7oz cans of Ortega Green Chiles that are in the taco section of every large grocery chain. If you DO have access to fresh Hatch Green Chiles, then head on over here for my recipe of Hatch Green Chile Sauce. 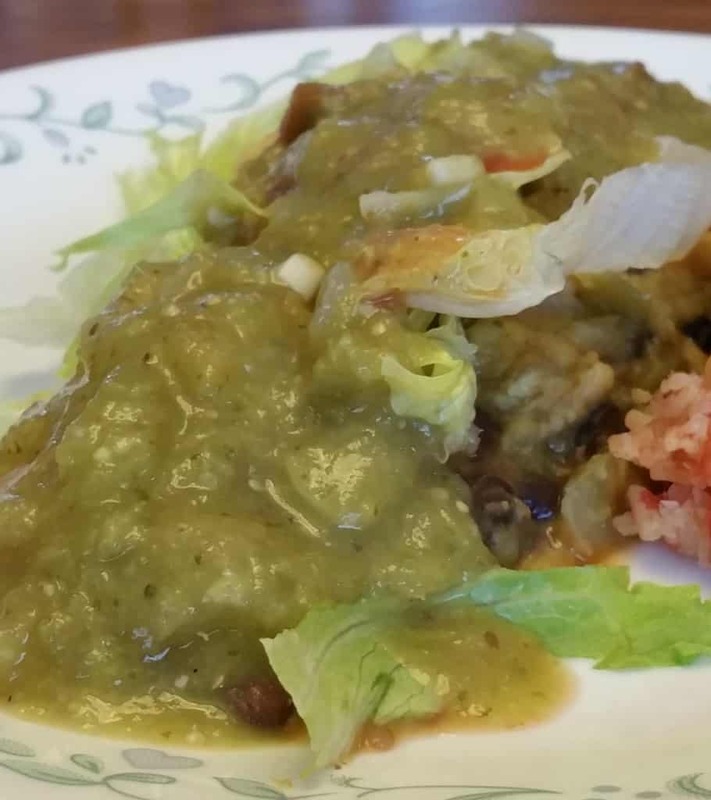 Hatch Green Chile has a totally different flavor and is a major part of New Mexican Cuisine. There’s just no comparison. For the rest of us, those little cans of Ortega will have to do. The process is pretty simply, sauté some onion, garlic, and jalapeño until softened. I used Imagine No-Chicken Broth for the liquid. If you can’t find that, regular veggie broth should work just fine. Next stir in some flour until you get a thick paste. This is called a ‘roux’. Brown that just a tad and then add the rest of the broth. The flour will make our sauce nice and thick. Stir in your chiles and salsa verde. Again, salsa verde should be right there in the hispanic section of your grocery store along with the salsas and taco shells. It’s simply a salsa made with tomatillos, peppers, and cilantro. It adds just the right amount of spice to the sauce. Add seasonings and cook until it thickens. Now ladle out 4-5 scoops of the sauce into a blender and add 3 fresh tomatillos and some cilantro. Tomatillos are little green tomatoes with a papery husk around them. I found mine in the produce section next to the jalapeños. I quartered them and tossed them into the blender along with a few sprigs of fresh cilantro. I recommend you go easy on the cilantro. I like the flavor, but the wife – not so much. The point is some people like it, some don’t. Add a bit and taste it before throwing in the whole bunch. I added about 5-6 sprigs of cilantro, stems and leaves. Blend that all up and pour it back into the pot with the rest of the sauce. It will be bright green now thanks to the tomatillos. That’s ok, it will change color as it cooks. Once the color fades and it’s nice and thick and bubbly, it’s done. You can use this Green Enchilada Sauce on just about anything. Pour it over your rice or baked potato. Make a green chile veggie burger. Use it as a taco sauce. The possibilities are endless. For MY enchiladas, I used a can of low-sodium Black Beans and some of this amazing Vegan Cheeze Sauce. I swear this cheese sauce is just flipping incredible. Whoever thought of making cheese out of potatoes and carrots is a genius. If you want to go all authentic on your family and impress the heck out of them, be sure and dip your corn tortillas in the pot of enchilada sauce. This will soften them and make it easier to roll up into enchiladas. My wife and omnivore daughter raved and even went back for seconds. In fact my daughter was headed for a food coma because she couldn’t stop eating. And I’m pretty sure whatever leftovers we had are going with her in her lunch. So I’d say that it was a definite success! Hope your family enjoys it as much as mine. This a simple green enchilada sauce you can make at home, made from fresh, whole ingredients, that's better than anything you can find in a store. I have fresh, frozen Hatch Roasted Green Chiles. How many shall I use for this sauce?